As a little girl, I thought I'd grow up, have a happy little family, in a perfectly orderly home. Little did I know, kids make messes; moms have very little time for themselves, and orderly is pretty hard to achieve. I wish that everything in my home and life was in it's proper place, but I haven't achieved that level of domestic perfection yet, and I doubt I ever will. It seems to me, even as a grown up, that some women manage to be pretty near perfect. I know it's not the truth, but it can seem that way. I decided to start a little confessional. I'm going to admit a few of my faults, and let you in on some little secrets. 1. 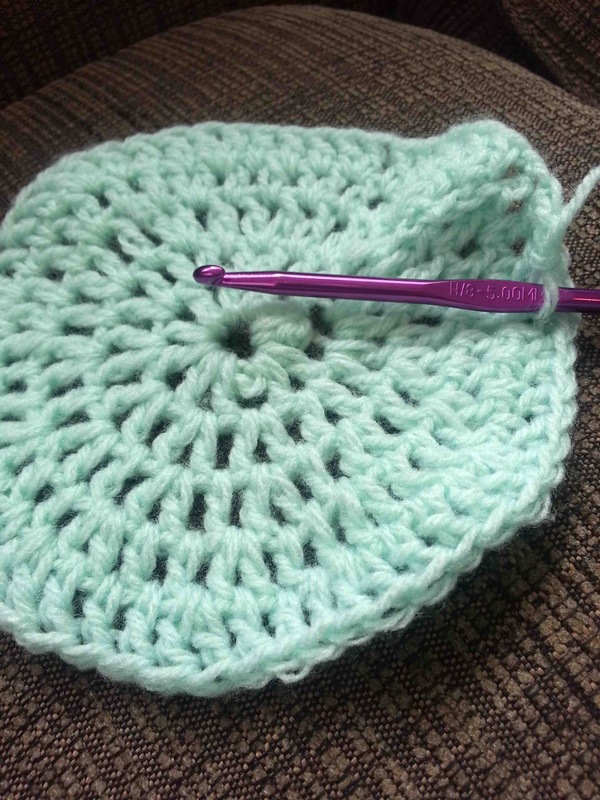 I am learning to crochet. A couple of years ago I taught myself to knit, or at the very least, knitting basics. I've made a few things, but finally decided that it was time to learn to crochet as well. I'm working on a hat right now (above). My stitches definitely aren't perfect, and I have a horrible time ending up with the proper number of crochets. I'll admit that because I'm a beginner. 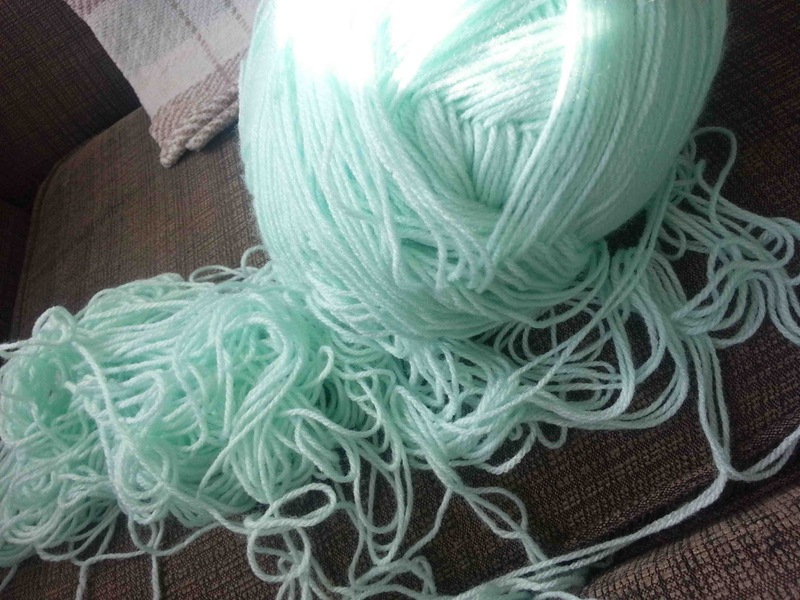 What I'm not so happy to admit is that my skein of yarn looks like this. I would like to say that it was my child. Heaven knows it wasn't my cat, for I don't have one. The truth is though, I'm not 100% sure that it was my child. This particular skein has been in my knitting bag for a couple of years. Confession: sometimes I have a hard time finding the tail of the yarn. Go ahead, cringe. Confession #2: My curling iron looks like this, and has for a couple of years. 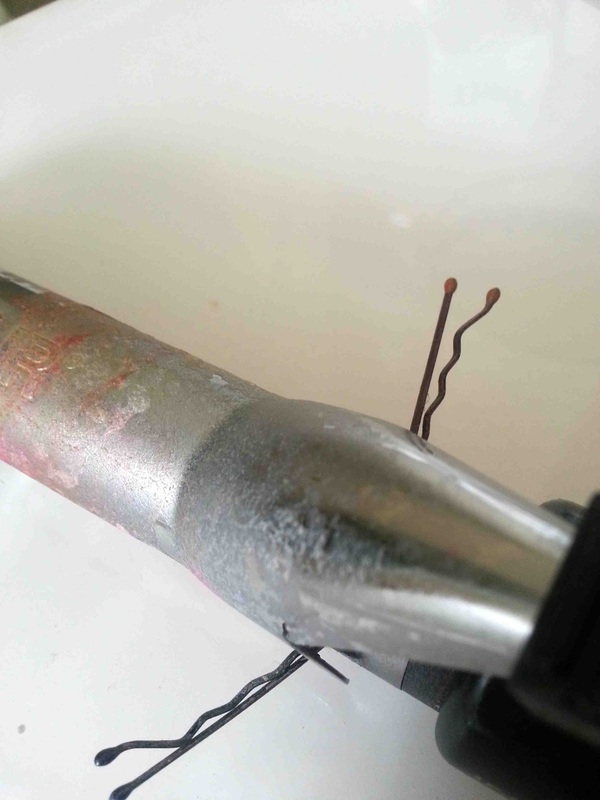 Held together with two bobby pins, and coated in hair spray residue, and pastels. Yep, gross. Yes it needs to be replaced. Will it be in the near future? Don't count on it. Diapers trump curling iron. 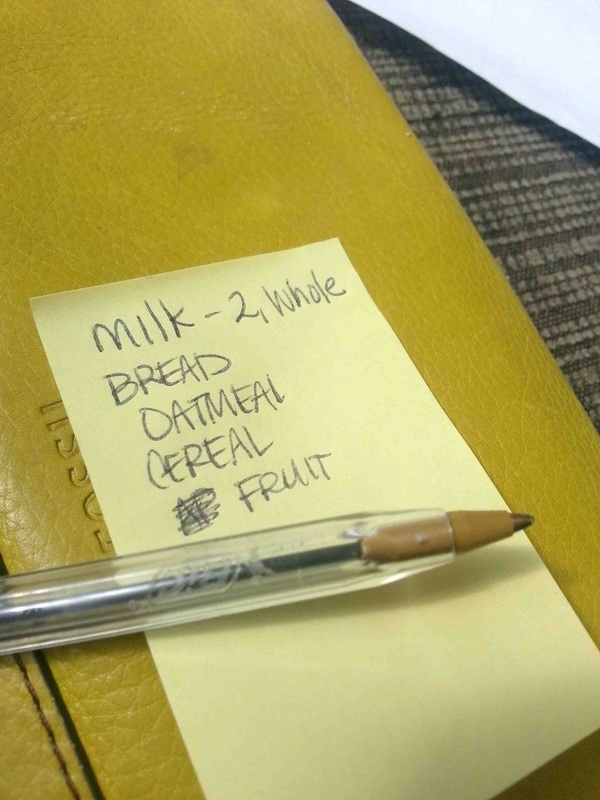 Confession # 3: I still make post-it note grocery lists. Not a bad thing, but considering the amount of money paid for my smart phone, I should probably get used to the idea of making a digital list on my phone. One less thing to take to the store. Confession #4: I've been a horrible blogger. When a blogger suddenly drops off the face of the earth you can jump to a few conclusions. 1-They are writing a book (not here). 2-They are moving (once again no). 3- They are sick of blogging (not so much, I just haven't found the energy). 4-They are pregnant. Ding Ding Ding. You're probably feeling that I was just pregnant, and guess what, so am I. This little baby was a bit of a surprise, but we are excited just the same. We'd planned on waiting until after my husband got through school, but apparently this baby had other plans. The kids will be about 23 months apart. That aspect terrifies me, and the fact that we will probably end up with a mini-van. So I apologize for the lack of tutorials and sewing projects. My energy levels have been next to nothing since mid-December. 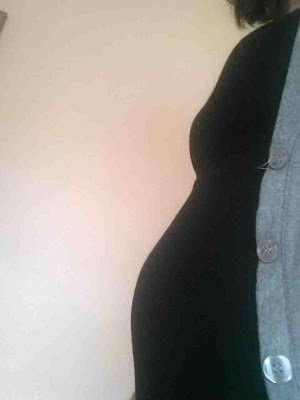 We are 14 weeks along, even though I look like I'm 5 months pregnant. My belly gets huge when I'm pregnant, and apparently my abdominal muscles aren't going to fight it this go round. Anyone out there have kids less than 2 years apart? I'd love some advice on how to adjust. We are planning on finding out the gender, so you can expect a fair number of projects to start popping up in around 6 weeks, until then.....I can't make any promises. So any confessions you'd like to make? I'd love to show you my horrible craft closet, but I'm not sure I'm emotionally prepared to admit the sad shape it's in. Haha, oh man, that was nothing! :P My confessional would include things like: My kids wear their school uniforms to bed, then get up and wear them to school again; I do lots of hollering and screaming when the kids aren't listening, and wonder if the neighbors can hear; my regular babysitter is the TV...etc etc. As for the kids 2 years apart...easy peasy! My oldest 2 are 22 months apart, and the youngest 2 are exactly the same, 22 months. And yes, at first the thought can be overwhelming. But all of my kids potty trained at about that time, or just before the new baby arrived, so that was one part taken care of. And honestly, I think I prefer it. We had 3 years between the 2nd and 3rd, and it was such a gap that we almost didn't want to "start over" with the diapers, baby gear, etc. Plus, as they get older, the siblings closer in age are SUCH good friends. I get a lot more fighting between the two who are 3 years apart than the ones who are 2 years apart. They're just a lot closer in their developmental stages. Hang in there, before long you'll forget how frustrating and overwhelming it was and it will all be routine. My two oldest daughters are 23 months apart, and it was actually great. They played together all the time, and still spend lots of time together. It's almost like they had a built in friend. They got along much better than my sister and I did (we were three years apart). Congrats!!!! So excited for you!!!!!!!!!!! :) PS I've really been thinking about getting my house more in order. Right now it's just a physical focus but the budget is up next. Wahoo. At least my fridge got cleaned out and I polished my cabinets even if I'm way behind on blogging. Congratulations! :) I'm with Kandice, that is a very mild "confessional" list. We all have our faults and unfortunately, there are always those few seemingly "perfect" people that make us all want to simultaneously punch them and ask for their secrets for a perfect family/life. You are wonderfully talented, beautiful, a wonderful mother, and I hear mini-vans aren't so bad. In fact, I think we're on the verge of breaking down and getting one. P.S. Amber's boys are all really, really close in age. Mine are 4 years apart. Each scenario has its advantages and disadvantages. Keep smiling! Congratulations on your bump! I share one of your confessions, the yarn... I blogged about it a few weeks ago (http://heavenlyhandmades.blogspot.co.uk/2013/01/how-not-to-start-crochet-project.html) Shameful!! Congratulations! My two oldest are about 2 years apart. Actually, that wasn't very hard, because afterall, I did have two hands. But when baby #3 came along, I ran out of hands, and then it was more tricky. But by then, child #1 was big enough to do little tasks for me, so it was helpful. But number three was by far the hardest to manage. Congratulations on having a baby on the way! I do too, and it really does interfere with my creativity more than I thought it would. Confessions: My yarn skeins have a tendency to fall apart like that too...and then the parts that came apart get all tangled up. No fun. No smart phone either... and half the time I forget my list and can't remember most of what I wrote on it. Congratulations on the pregnancy! Advice on kids? I just had my third she is 1 month old. My oldest two are 15 1/2 months apart and these two are 21 months. Just be patient and give yourself time to adjust. That is my only advice. You figure it out and the kids will be such good friends as others have said. It might seem crazy for the first few weeks but things work themselves out :) You will do GREAT! Confession: I am a pile-er, when I clean I pile things all over and call it clean....I'm in need of some major organizational skills! I am 14 months older than my little sister. And my hubby is 13 months older than his little brother. Don't know if this is true with my hubby and his brother, but my sister is one of my best friends. We have another sister that is about 3 years younger than me. The problem with that is that we don't get along all 3 of us at the same time. My kids are all about 26 months apart. And I love that gap. Just enough that you can get the older one potty trained, but not so much of a gap that you don't want to do the baby thing again. One suggestion is to go at your pace with your kids. Don't compare to others. And enjoy every moment with those cute kiddos, they grow up way too fast! Congratulations! How exciting to have another one on the way, even though unexpected. I still have yet to get my crafting groove back post-baby. Maybe one of these days I'll be a regular blogger again, but at the same time I'm quite happy not putting pressure on myself. And I still to hand written lists. I'd rather not constantly pull my phone out while shopping. And tip for making your yarn not get so nasty--undo the entire thing and then wrap it back up in a ball. It seems tedious to do that, but really pays off with not having a crazy mess of yarn. I have been crocheting for 40 years and sometimes my yarn still looks like that. I had 2 boys 22 months apart and it was great! As soon as the second child could play they kept each other busy. It's only hard at the very beginning and it goes by so fast. Try to enjoy it as much as you can, before you know it they are adults. I was such a fantastic parent before I had kids! ;) I use post it lists too and guess what, I put one on my steering wheel the other day to remind myself to stop for groceries the next morning, and then my hubby used my van and he obviously saw the list on the steering wheel, who wouldn't, and he got the groceries for me! Let's see that happen with digital lists, ha. My youngest two are 20 months apart. I was borderline hysterical when I found out (no, really, I laughed for like five minutes, all by myself in the livingroom) because my middle child was walking by 9 months and was and is completely hectic. I was pretty nervous. But fortunately #3 is pretty easygoing and it wasn't nearly as scary as I thought it would be! And I do love that they likely won't remember life without each other and be great buds, my girls are 3 years apart so despite the gender differences the littles will likely be thick as thieves. Hi, I just stumbled upon your blog, and I'm glad I did! I'm now following! My SIL had 2 kids 12 months apart to the day, and I don't know how she did it, but she survived! Now her kiddos are older (4 and 3), and even though she would have never planned that, she loves having them close because they are good play buddies. Anyways, I'm excited to see what you've got in the future! Wahoo! I'm excited for You, and Jake, and Clark, and Miles! I wish I was closer and could help you out. I feel like I have the smallest comment. Congratulations!! My boys are 27 months apart, so not too much different. Once they get to where they can keep up with each other and enjoy similar things, it is awesome! My little guys are just barely getting there :) And I won't be showing my craft table off anytime soon either- it's a serious WRECK! Hope you keep feeling well and getting your energy back- best wishes! I had 3 children under the age of 4 all at the tender age of 24. My last two were 12 months apart. They are now 25,22 and 21. I wouldn't change one thing. They are so close to each other. I love that part the best. In high school they all triple dated and all hung out with each others friends. I am blessed that they remain so close. You will get through this stage and wonder, one day, how quickly time flew. Treasure, savor, memorize, greedily hang onto every moment. They are grown and gone way too quickly. My kids are 18 1/2 months apart, and I'm expecting again. It's funny, because the last 2 feel like they will be SO far apart to me, but it will only be 26 months. It's all about perspective. I love how close my kids are. There are days that I've cried my eyes out, because it's hard. But I wouldn't trade it for anything. They are such good friends, and I love that my older one really didn't learn much about selfishness and "mine" before her brother came along. You will do awesome!